Defense is a very important chess skill. At least in about 50% of a chess game, we need to defend. In some games, we play with Black pieces and White makes the first move, and for that reason, White has the opportunity to start the attack/initiative. In some other occasions, one will make a mistake and he or she is forced to defend. Thus, defense is as important as attack. The course is suitable for beginners and intermediate level players, but it will be helpful for advanced level players, too. Even if your ELO is 1900+, this course will help you improve your defending skills and you’ll learn some new things. If you want to strengthen your defending skills and stop losing games under pressure, then this course is for you. How to think and defend your positions in the opening? How to create a solid repertoire against an attacking player? When to defend and when to ignore opponent’s attack/idea? Do you always have something ‘better’ not to resign? How to stop losing initiative/material? How to make counter-attack (instead of just defense)? White has an advantage of moving first, thus Black needs to defend right from the first move. This course is not about the openings but it will teach you how to think and defend your positions in the opening. Learn different approaches for playing opening stage properly. With the accumulation of practical experience, we will learn to determine the measure of the acceptable risk, which indecently strongly depends on the initial position. On the end, it is also very important to tell you something about the mindset in the hard situations. Yes, it is possible to eliminate 90% of your errors. 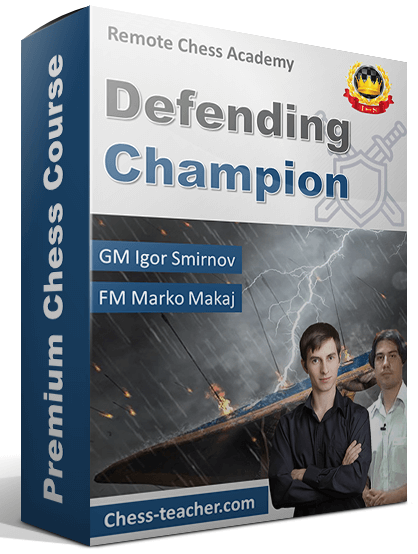 In this course GM Igor Smirnov will show you exactly how you can do it. Learn about the very common psychological problems of the chess players due to that, players make terrible mistakes that costs them a lot of games. Author explains why defense is important. Lesson-2: How to defend in the opening? Lesson-5: How to evaluate position? Learn importance of evaluation in chess and how to evaluate positions. In this lesson, you will learn how to use the resources in defense very economically. Learn how to consolidate and save lost position. The fortress is a very common thing that people tend to consider chess with. Learn how to build a fortress in your games. Gambits are usually used by an aggressive player so you should try not to take those gambits. In this chapter, GM Smirnov show how to deal with such gambits. In this lesson, we will analyse the 3 most important methods of defense. In this lesson, GM Smirnov explains the practical way of thinking. It is necessary to put the received knowledge into practice. There are 9 practical tasks (over 100 games) in this course which will help you to understand and remember the ideas of the course better. The training program has a detailed explanation on what and exactly how you should do the practical tasks. Choose from 12 different mirrors! Password: May I Be Cursed To Lose Every Chess Game if I Dont +1 The Uploader! When you copy+paste the password, make sure that there are NO "spaces" at the beginning or end of the password. The Password starts from M and ends on ! and has spaces in between words! I've compressed the files but have kept the same video resolution and the audio is stereo. The quality is pretty acceptable IMO. I've also included ALL the contents from the CD, the eBook, the practical PGN and even the autorun works. So if you wish to use the softwares and the GUIs, they too are ALL working! Can you repost new links, please? kabire00 wrote: Can you repost new links, please? How to think and defend your positions in the opening?How to create a solid repertoire against an attacking player?When to defend and when to ignore opponent’s attack/idea?Do you always have something ‘better’ not to resign?How to stop losing initiative/material?How to make counter-attack (instead of just defense)? Author explains why defense is important.Lesson-2: How to defend in the opening? Learn how to defend without losing pieces or materialLesson-5: How to evaluate position? It is necessary to put the received knowledge into practice. There are 9 practical tasks (over 100 games) in this course which will help you to understand and remember the ideas of the course better.The training program has a detailed explanation on what and exactly how you should do the practical tasks. When you copy+paste the password, make sure that there are NO "spaces" at the beginning or end of the password. Can you repost new links please. Thanks in advance. this link works fine. Thanks!!!! !